You can remove traditional wallpaper by following four easy steps of applying a solution, scoring the paper, scraping the walls and cleaning afterwards. Whether you are moving into a new home, or you just feel like a change in decoration, removing wallpaper can be a difficult task. 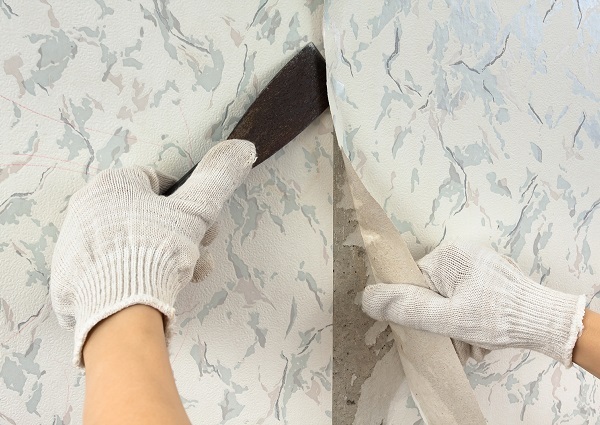 If you haven’t removed wallpaper before, then you might want to read our guide on how to do it properly before getting started. By following our simple steps, you can make the task of removing wallpaper much easier and quicker than it would otherwise be. You will need to start by making sure you have prepared for the job at hand. The first thing that you should do when preparing to remove wallpaper in a room is to ensure that you have fully prepared. Firstly, make sure that you have cleared the room or at least moved furniture out of the way of the walls in question. Make sure that any furniture that remains in the room is covered using dust sheets to keep it protected. Also, ensure that you put dust sheets down on the floor to avoid having to clean up a messy room afterwards. Turn off the electricity in the room and make sure that all plug sockets and switches are covered with masking tape. Step 1: Mix your solution together. Wallpaper stripper is best for this, so follow the instructions and mix with water to create the ideal solution. Step 2: Apply solution to the wallpaper. Using either a spray bottle or paint roller, apply the solution to a section of the paper and allow it to absorb. Step 3: Scrape the wallpaper. Using your putty knife, start to scrape off the paper. It should become soft and come away from the wall easily. If it doesn’t you might need to score the paper. Step 4: Score the Wallpaper. If the paper still isn’t coming off easily, score along the paper with a tool or the sharp edge of your putty knife. Re-apply wallpaper stripper and allow to soak into the paper. Step 5: Clean the walls. Once you have removed most of the wallpaper, you should give the walls a good clean with soapy water or sugar soap. This removes any glue stuck to the walls or any paper left. There are other types of wallpaper that can be easier or more difficult to remove but you should largely follow the same principle when stripping walls. You might find that the walls have been decorated with stripable wallpaper, in which case you should be able to peel off easily after applying a little wallpaper stripper. Peelable is similar but will have a backing that you need to remove like traditional wallpaper. And that’s all you need to know to easily remove traditional wallpaper. You could also use a wallpaper steamer, but this can present other problems. If the wallpaper has been applied using an extra strong adhesive then a wallpaper steamer might not be effective at getting the paper off. It can also cause problems if you have drywall, too.